Every summer for the past eight years, I have taken a trip in one of my favourite places to explore - Algonquin Park. I was first introduced to the park while attending Camp Huronda, a summer camp for youth with type-one diabetes. This photograph was taken last summer when I ventured out on a three day, two night trip as the counseling director, leading a group of junior counselors. As we were settling for the night on Potter Lake, I noticed the sun was going down, generating a silhouette of the land and trees, which surrounded our campsite. We were the only ones camping on the lake that night which allowed us to further hear nature speaking to us. The thing that drew me in the most were the reflections that the lake had picked up. The dark outline of the trees helped to distinguish the uniqueness of each tree and the relative age of the trees in comparison to each other. Like humans, no two trees are the same and this moment captured me until it was total darkness until morning. Algonquin Park continues to be a site of environmental education, outdoor recreation, and wildlife research. This National Historic Site of Canada has inspired me as an artist as it has for many others. As a result, I have gained a greater sense of the country and appreciation for the environment, recognizing the importance of leaving no trace when camping. 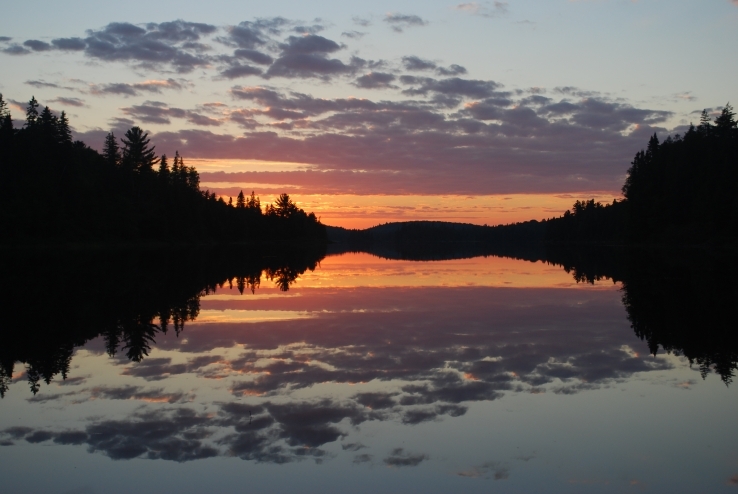 Algonquin Park stands to reflect the importance of Canada's protected areas that as a Nation we are blessed with.